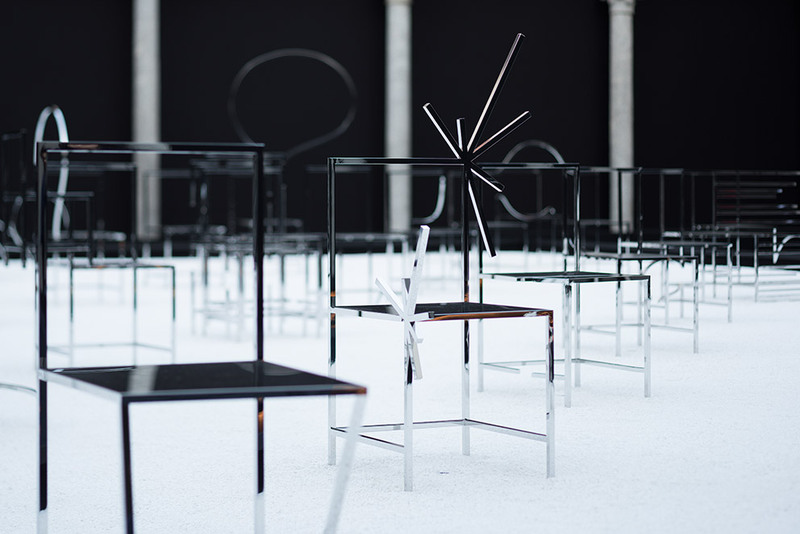 Oki Sato is pretty much at home at the Salone del Mobile. In 2003 and 2004, he exhibited at the Salone Satellite, but in 2005 was already showing his products in the halls of the great. Since then he has not only maintained an office in Tokyo, but also a studio in Milan, where he spends a week every month. This enables the 39-year old jack-of-all-trades to keep a constant eye on the projects for his European clients. After all, Oki Sato leaves nothing to chance. In this regard, or so he says, he is very Japanese. Uta Abendroth met the man who was born in Toronto and grew up in Tokyo, next to his Manga Chairs. 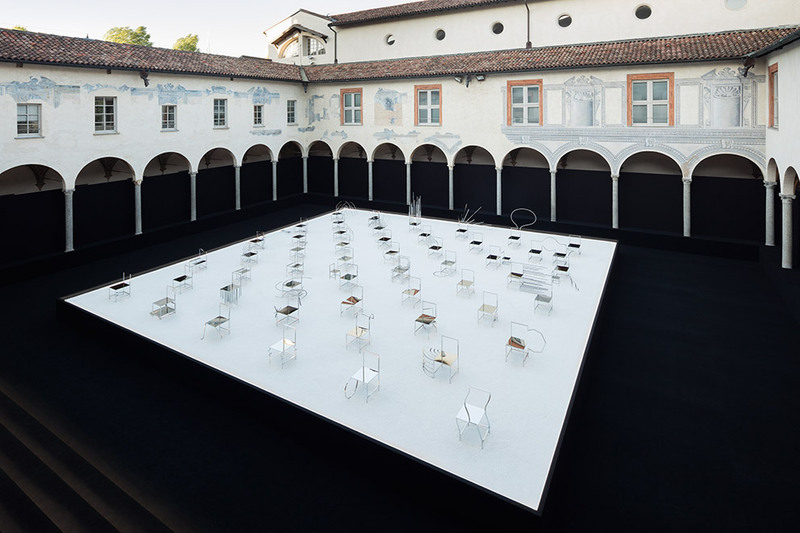 Uta Abendroth: Oki Sato, that’s a lot of really whacky chairs you’ve assembled here in the cloister of San Simpliciano. Oki Sato: Indeed, they are really extraordinary. I got the inspiration for them from Japanese manga comics. As a child I was always reading them, and my mom got really mad at me because of it. She thought I ought to be reading something educational, and would have liked me to visit museums and galleries. But I ask myself what the difference is between a museum and the mangas, or between an art gallery and the mangas. I’ve never stopped thinking about that, and so I ended up doing a bit of research. The history of mangas goes way, way back, they’re a part of Japanese culture. They express feelings, emotions and spiritual movements, and all that by just using two-dimensional lines and straightforward black ink. I thought I could give this method of expression a 3D form, and make furniture or other objects with it. That is ultimately how these 50 Manga Chairs came about. Why 50? Is the number particularly significant in Japan? Oki Sato: No, not at all. 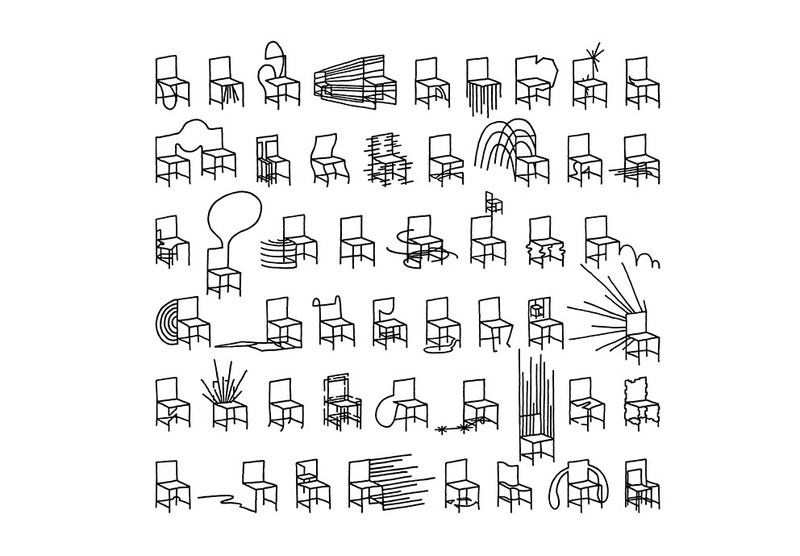 To begin with I was thinking of more than 80 chairs, but when we began working on the details we somehow ended up with 50. That was just right, because like the images in manga books we wanted them arranged in a square grid. We don’t want the chairs to tell a story, but for the people looking at them to think of a story of their own. As such we are just providing food for thought. Isn’t there a danger that only the Japanese will understand? Oki Sato: I noticed very quickly that in fact lots of people understand the installation and that it is by no means something typically Japanese. 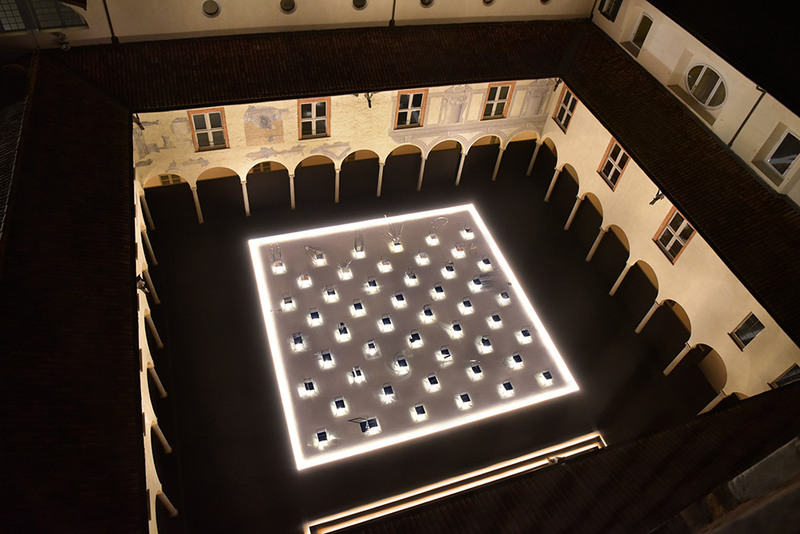 Rather, the whole exhibition targets our emotions, and here in Milan I very much sensed that the visitors associate strongly with the chairs. Do you have a favorite among the 50 chairs? Oki Sato: To be perfectly honest, two. The simplest, which is somewhere in the middle. It’s just a chair, with no extras. It was the starting point for all the other versions. And my second favorite is the one that was most difficult to make. It looks as if there’s an explosion just taking place in its back. The many “rays” emanating from it make it so heavy it takes five or six guys to move it. This particular model arrived in Milan damaged, so we flew in the Japanese craftsmen, hired a welding machine, and repaired and re-polished the chair – it took two days. That means you had all the chairs made in Japan? Oki Sato: Yes, they were all made in Japan. They were polished in Niigata, where there are lots of metal workers who are also experts when it comes to polishing. The same people polished the first iPods. It took four months until all the chairs were ready. If there was just one scratch anywhere, we started from scratch again. It was a lot of work. How long did the project take altogether? Oki Sato: A good 18 months. I was familiar with this location here on Piazza Paolo VI and from the outset was very taken with the atmosphere, wanted to do something here. Everything here even reminded me a bit of the mangas. 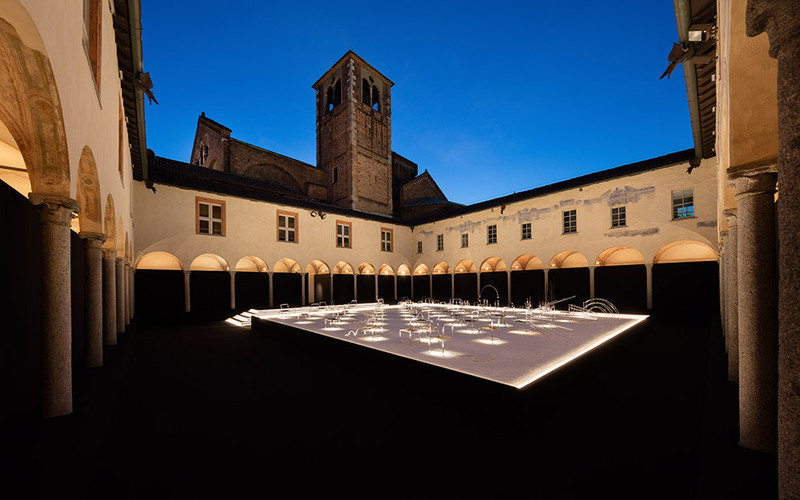 I like the size, it’s not too big, not too small, there are no trees here in the courtyard, and I like the contrast between old and new, between texture and non-texture, black and white, and even the sky, which changes depending on the weather. The chairs reflect all this. One morning there was a woman in a red dress here, having a look around. The chairs also changed with the color of the dress – it was marvelous! And in the evening, when we switch on the illumination, everything looks totally different again. This is the first time we’ve done a project like this and I must say I’m really enjoying it. Was all this just your idea? Oki Sato: No. We had a long discussion with the Friedman Benda gallery in Chelsea, New York. 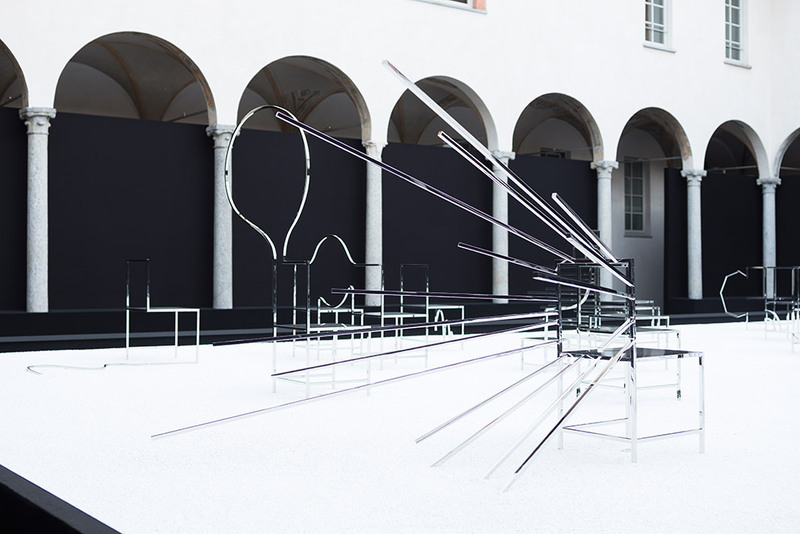 We wanted to make neither an object nor an installation, but something somewhere in between. The chairs are of course chairs, but they create space in between, and that was the challenge we set ourselves. Will the gallery continue to be involved with the chairs? Oki Sato: We’re going to be showing the chairs in the gallery in September and from then they’ll be for sale there as well. Oki Sato: I haven’t seen much yet, but I have noticed that there are a lot of Japanese companies and designers exhibiting here. What is it about Japanese design that fascinates you? Oki Sato: Japanese design possesses a great simplicity and is very minimalist, on top of which it exudes lightness and poetry. Of course that’s not enough to create a bond between people and an object. But I think there has to be a type of friendliness and fun. I always try to achieve that and, being Japanese, not to be too cool. Yes, there is humor in all my designs. And I feel totally relaxed when I see all the Japanese who are making good things, that way I can play about and have the greatest possible freedom. Pralines, soap, chairs, tables, luminaires, you design so many different things – isn’t it difficult? Oki Sato: Not at all! Working on various things at once is far easier than dealing with the same thing every day. Really, designing 100 different pieces of chocolate is far more difficult than supervising 400 different projects. It’s the variety that is fun. Next month, for example, we’re opening a shopping center in Bangkok; 2018 sees turnkey of some other architectural projects. Then we do things exclusively for the Japanese market – and then again projects such as here for the Salone. I’m interested neither in the size of an undertaking nor the material, for me everything is design. Are you more of an Art Director or actually still involved in the design process? Oki Sato: I really am wholeheartedly a designer. I particularly like working on the details. For this installation for example: We laid the black carpet, but wherever different parts meet, the white edges were visible. I went and bought felt pens and then we all got down to painting the edges black. Perhaps no one even sees it, but for us it is very, very important. Of course we don’t want people to pay attention to the carpet, they are meant to be focusing on the chairs. These are important details for me – and that is something really Japanese. 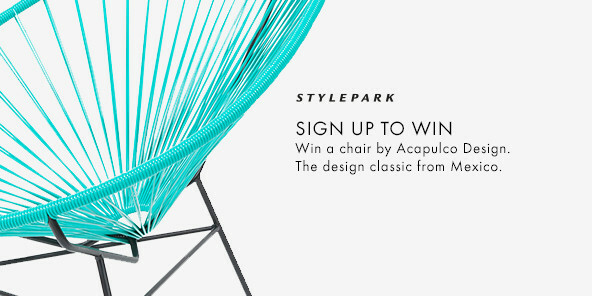 During the Salone your steel chairs are on display, your plastic rocking chair at Kartell, your marble tables at Marsotto Edizioni, and more as well. Is there one material you prefer over another? Oki Sato: No, they are different clients, different techniques, and they all have a different history, which you can’t compare. What I work with is all the same to me, I just throw myself into the project. It’s part of the game – and it’s a game I’m really enjoying to the full!